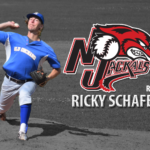 Old Orchard Beach, ME – The Empire League has moved right handed pitcher Ricky Schafer to the New Jersey Jackals of the CanAm League. Ricky Schafer is the all time wins leader in the Empire League and posted very good numbers in the Empire League. He posted a 2.18 ERA with 8 Wins and only 1 loss in 66 total innings pitched. He struck out 54 batters and only walked 14. The Empire League recognizes the Old Orchard Beach Surge General Manager Sean Getchell on his reffering efforts. The Surge are eligible to sign another pitcher due to the moving of Schafer.